Guests enjoyed complimentary drinks, appetizers, and desserts catered by Four Seasons Las Vegas as award winners were announced and honored by the evening’s emcee and Greenspun Media Group’s publisher, Gordon Prouty. Prouty was joined on stage throughout the evening by title sponsor Cox Communications’ vice president of field operations for the west region Jeff Breaux. Many of the honorees delivered speeches accepting the awards and thanking those that contributed to their successes as the city’s preeminent technology executives. 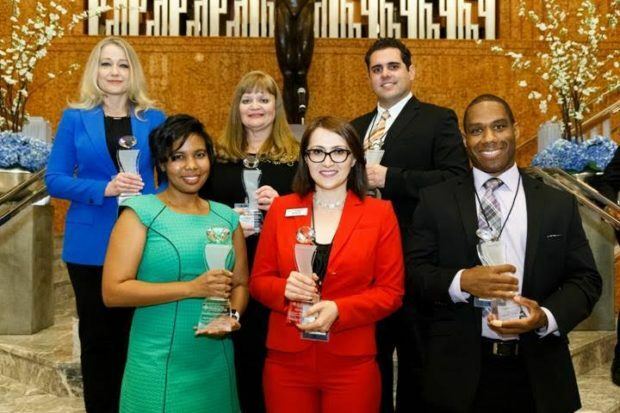 Honorees will also be featured in the Sunday, November 20, 2016 issue of The Sunday and Monday, November 21, 2016 issue of Vegas INC.
Honorees were determined by an independent panel of judges, many of whom received a Top Tech Exec award in 2015. Selections were based on factors such as recent achievements, impact on his or her company, major projects, and more. Dr. Camille McCue, director of tech innovations at Adelson Educational Campus, was honored with a Lifetime Achievement Award. Dr. McCue has over ten years of experience teaching science, technology, engineering and math (STEM) to students K-12, has written several coding “how to” books, and has developed curriculum for Spark Skill STEM startup. Her dedication to teaching all things tech can be also seen in her development of a year round educational enrichment program for high-achieving Las Vegas area youth, and her publications “Coding for Kids,” “Getting Started with Engineering,” and “Getting Started with Coding.” Dr. McCue worked at Nasa, IBM, and The Alexander Dawson School before spearheading a game-changing technology innovation and integration initiative that includes a startup incubator for students at Adelson Education Campus. This year’s event sponsors were Blueprint Consulting Services and SIM Las Vegas chapter. For more information on the 2016 Top Tech Exec Awards, please visit www.VegasInc.com.